The Toolbar config screen allows Engineers to configure their Toolbar to activate existing Blocks and Tools or build new blocks. The Toolbar Config screen can be accessed by default by pressing the 'G' key (this can be configured under the "Systems 1" section of the controls option menu). An example is shown to the right. Once you have found the item you want, simply click and drag it down to the position on your toolbar you want it to be in. What shows up on the Toolbar Config screen changes depending on context. When outside of any ship, it lists every Block and item in the game, but while one is piloting a ship or in a Control Station, the screen instead only shows Blocks, Tools, and Weapons that actually exist on that particular ship. The toolbar configuration screen can be overwhelming at first due to the sheer number of blocks and tools that can be used. Use the navigation panel on the left to filter blocks by classification, or use the search bar in the upper-right if you know the name of what you are looking for. 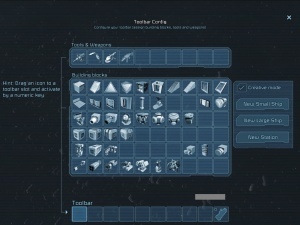 Hand-held tools are under the "Character Tools" section, and while you are piloting a ship the available tools and weapons (such as drills on a mining ship, welder/grinder on a construction ship, or guns and missiles on a combat ship) are under the "Weapons and Tools" section. As a new player, be wary of the "All Blocks" section when piloting a ship; these are the individual blocks on the ship rather than groups, so you might end up binding only one of your four drills! This page was last modified on 16 March 2016, at 19:18.